The Chilkat is a reproduction of an original weaving in the Canadian Museum of History in Hull. Originally woven from mountain goat wool and cedar bark, these blankets were the specialty of the Tlingit, whose territory was at the mouth of the Chilkat River in Alaska. 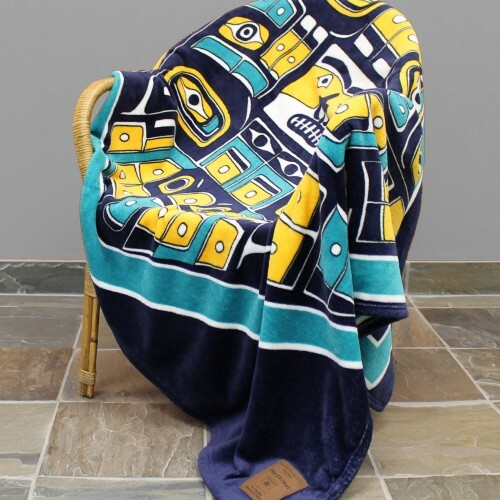 Using highly abstracted crest designs in blue, yellow, white and black, this exceptional Chilkat blanket was initially developed by the Tsimshian people of the same area and bears the weaver’s interpretation of the traditional “Diving Whale” pattern.